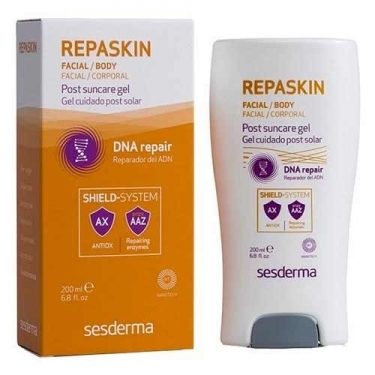 DESCRIPTION: Repaskin Post Suncare Gel from Sesderma is a gel that calms, moisturizes and repairs the damage caused by solar radiation. This post-solar care results from the combination of active ingredients: enzymes encapsulated in liposomes, Asian Sparkling extract and chamomile, aloe vera, ginko biloba and DNA repairing actives for a moisturizing, restorative, soothing, antioxidant and anti-aging action for a skin smooth, nourished and healthy. It moisturizes, calms and prevents the formation of free radicals. It repairs cellular DNA damage overnight. 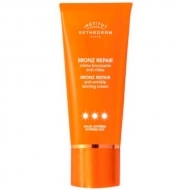 Apply to the skin of the face and body, perfectly clean and dry after sun exposure.